We are excited to be returning to the New York Comic Con this year! We are booth 1344, right in front of the Marvel area. And, we will have a very unique exclusive! Everyone knows that when it comes to buying a piece of real estate it is location, location, location! 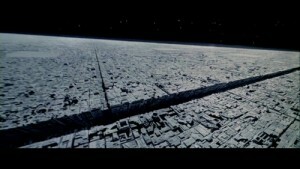 So here is your opportunity to purchase a very unique piece of property from one of the most infamous locations ever, the Death Star from Star Wars: A New Hope! 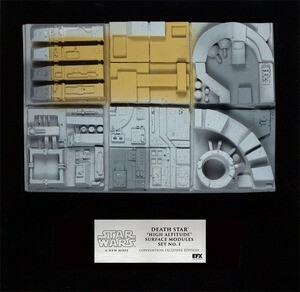 You can now own a replica of a set of 6 modules that were made to create the surface of the most iconic symbol of Imperial might, the Death Star! This display of modules (a.k.a. tiles) is a set of 6 of the high altitude modules in the “medium altitude” configuration. The modules are mounted on a wall mountable black acrylic and comes with a metal plaque. Starting Wednesday, September 16, we will make a very limited number available for pre-order for those who cannot attend NYCC. The price is $149 plus shipping/handling and CA sales tax, if applicable. Also, if you are an international customer, it does not include any duties or taxes levied by your country. PLEASE NOTE THAT IF YOU PRE-ORDER, THE ITEM WILL BE SHIPPED TO YOU AFTER THE CONVENTION, APPROXIMATELY THE END OF OCTOBER. ALSO, IF YOU PRE-ORDER, YOU CANNOT PICK IT UP AT THE CONVENTION. WE APOLOGIZE FOR ANY INCONVENIENCE, BUT THE EXTREMELY HIGH UNION COSTS AT THIS VENUE LIMITS HOW MUCH PRODUCT WE CAN BRING. HOWEVER, IF YOU LIVE IN THE CONTINENTAL USA, WE WILL SHIP IT TO YOU FREE OF CHARGE!